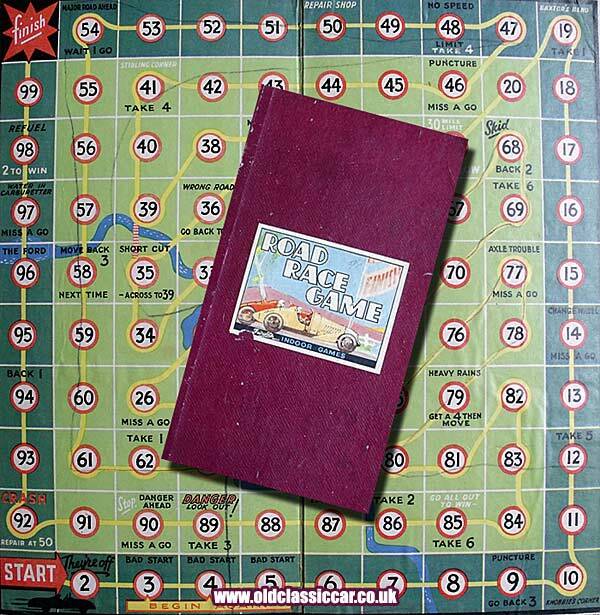 The Road Race Game, a 1950's board game by Fairylite. Homepage. This page: A thrilling motor racing game produced in the 1940s or 1950s by Fairylite of Great Britain. 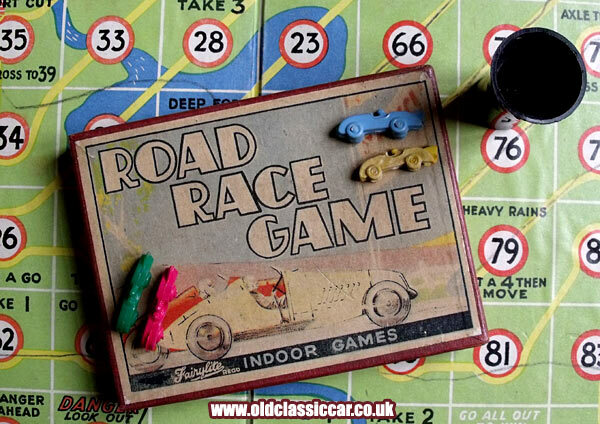 Here is another motor racing board game of the 1930s/1940s/1950s, similar in operation to others that feature in this section of the site. Competing motorists, in the case of this game four of them, tackle the course, all hoping to reach the chequered flag first. Small plastic cars plot the success (or otherwise) of each competitor as they take turns with the dice, their number of moves based on their throw. Punctures, heavy rain, skids, axle trouble and water in the carburetter do their best to scupper the progress of each racing driver as they tackle the course, with bends named Knobbie's Corner, Baxtor's Bend, and Stirling Corner to negotiate during the competition. The game was produced by Fairylite of London, with its instructions pasted into the lid of the box. The design of board and the illustration on the box suggest a date somewhere in the 1930s. However the pieces are plastic, so perhaps the game is a little later, or else later pieces have been included with this earlier game at some point. Another site suggests a date of 1955, which if this is the case, is a lot later than the style of the illustrations would suggest, although it could just be that the board game was introduced say in the 1940s, and continued in production for many years. The inclusion of Stirling Corner may just be a reference to Stirling Moss, who was active as a racing driver from the late 1940s and throughout the 1950s. Unusually, the dice is a tiny example made from a single piece of tin, folded into shape. Fairylite didn't confine their activities to car racing games though, as at a similar time they also produced the Airport Game, featuring a board around which plucky junior aviators had to make their way. Into the 1960s they produced a wide variety of toys, often relating to popular TV shows of the era, such as Fireball XL5 and Thunderbirds.